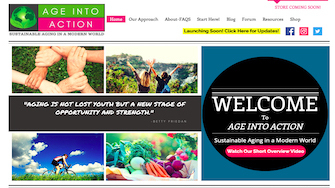 -Age Into Action by Joe Trevino- Joe Trevino took to spending his time in the Sustainability Capstone class to create a website to educate people about ageism and to help build a community. Many people have been conditioned by their social relationships, and by general public discourse, to view aging as an entirely negative experience. People are taught that aging is undesirable and that one should try to lessen the impact on their own lives as much as possible, both physically and mentally. These views have given rise to ageism. According to the World Health Organization, “ageism is the stereotyping and discrimination against individuals or groups on the basis of their age; ageism can take many forms, including prejudicial attitudes, discriminatory practices, or institutional policies and practices that perpetuate stereotypical beliefs.” Ageism affects society just as much as other forms of discrimination such as sexism and racism, but ageism has one unique feature that many other forms of discrimination do not share—ageism will most likely affect everyone at some point. In an unending cycle of spreading prejudicial attitudes towards aging, parents teach their children their own values including that getting older is undesirable. Parental views imprint not only ageist attitudes but ultimately lead the child to view themselves negatively as they get older (Levy “Age-Stereotype Paradox” S118). In response to this pervasive problem, I have created an age-positive, online community called Age Into Action to challenge the false notions of ageing that have permeated our society for centuries. Through engagement with others across the USA and the world, people who are experiencing ageism, those who have experienced it in the past, or those who feel they might be internalizing ageism, are able to see that ageing does not have to be a negative experience. Activities designed to help individuals break free from aging stereotypes are proposed to online 2 community members. The majority of activities are sustainability-based, meaning they encourage individuals to help not only the environment but also help the individual’s view of themselves and their communities. Check out the full final report here and his website here.